Looking for a DashThis alternative? 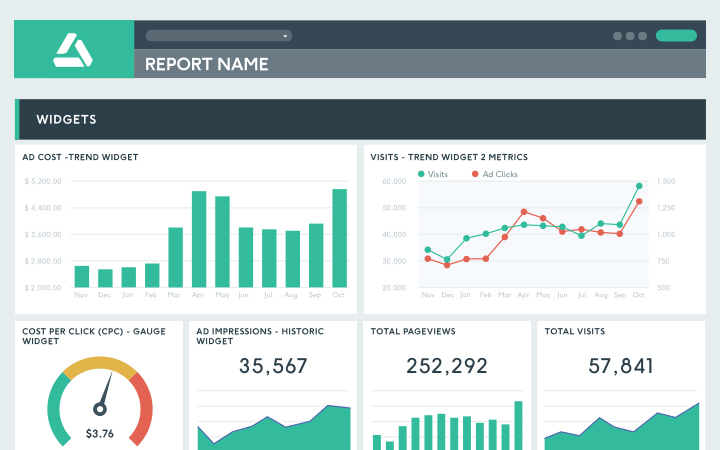 If you want to create perfect digital marketing reports, DashThis is the only all-in-one dashboard software solution created exclusively for marketers and marketing agencies like you. With our marketing reporting tool, you can gather all your data sources in the same report, get unlimited users in your account, and on top of that, you get the greatest customer support ever. Already tried DashThis? Drop us a line to see if we’re the right solution for you. Take a look at what DashThis has to offer! DashThis is an all-in-one marketing reporting tool that enables you to create any type of report you might want: email marketing, social media, google analytics, AdWords, web analytics... you name it, we’ve got it! You can then send your easily-created reports to your clients automatically with an email dispatch so that they receive their data in real-time, every month. With DashThis, you can gather all your KPIs from all your data sources in the same beautiful all-in-one digital marketing report. Want a report with social media data, some web analytics, SEO, and even your own Excel CSV files? No problem! DashThis is more than an analytics tool, it's a SaaS (Software-as-a-Service) that takes the "service" part as seriously as the "software" part! Even if you are just starting a free trial, with DashThis you get unlimited support from your very own account manager. We're even renowned for our epic customer support, as you can see in our user reviews. By the way, if you have any question about DashThis, drop us a line! We’ll be glad to discuss it with you! With DashThis, your clients can see and understand their data easily because you can easily arrange the layout exactly how you want it. Choose your graph and chart type, drag-and-drop them wherever needed, resize them, it’s all up to you. You can even add sections, or notes and comments to help your clients understand their business performance better. It looks easy, because it is! With DashThis you get unlimited users, unlimited customer support, as many KPIs or data sources in the same report as you may need... in other words, possibilities are endless! You can save hours of labour by simply using one of our preset report templates or by adding preset widgets to your reports. All the most common KPIs are preset for you so you don’t have to do any time-consuming manual work! Want to create your own custom KPIs with the metrics, dimension and filters you want? Of course, you can do that too! Ready to try the all-in-one reporting tool of your dreams? DashThis has all the features you need! Send your reports each month automatically with our easy email dispatch system, export them as PDFs, send their URL links, or print them out! You get to choose! Want to talk to a real human when you have a question? It's easy with DashThis! You get your own account manager who's here to answer your questions, help you create your reports, or jump on a call with you to show you around DashThis! You can add your logo, custom data, KPIs, notes, comments, and images very easily. You can even change the layout and section off your report by theme (PPC, SEO, Social Media) so that your clients will love and understand your report even more! Want your entire team to be able to access your business dashboards? You're in luck! With DashThis you get unlimited users, no matter the plan you choose! You heard me, no add-ons! That’s how easy it is to collaborate on your reports with your team! Bring all your favourite data sources and marketing platforms in one place with DashThis. Google AdWords, Google Analytics, Facebook, Twitter, LinkedIn, Moz... Gather all your data together with our 30+ native integrations and our nifty CSV file manager for your custom proprietary data. No add-ons, no third party systems, no problem! Some DashThis competitors may claim to be the best DashThis alternative, but according to our digital marketing agency clients, there's no such thing as a DashThis alternative: it's the perfect all-in-one marketing reporting tool! With all your important data sources, incredible customer support, and an easy-to-use interface, there's no alternative to DashThis! But don't take our word for it, just take a look at some user reviews. Need a hand? That's what we're here for! If you have any questions about DashThis, if you’re not sure if it’s the right solution for your reporting needs, talk to one of our awesome account managers! They’ll gladly answer all your questions!